We have Broadband from Virgin Media (am in the U.K.) and earlier this week there was a problem and the connection kept coming and going. The Virgin Media website said that there was a problem in my area. The connection was eventually restored and everything is now okay with my desktop and our phones. It has however left me with a connection problem on my laptop. In addition to the connection in our lounge (where the router is) we also have a wifi extender in another room. It plugs into the electricity and is called a BT Homespot P3F. It creates a hotspot in that room and therefore comes up a separate internet connection. 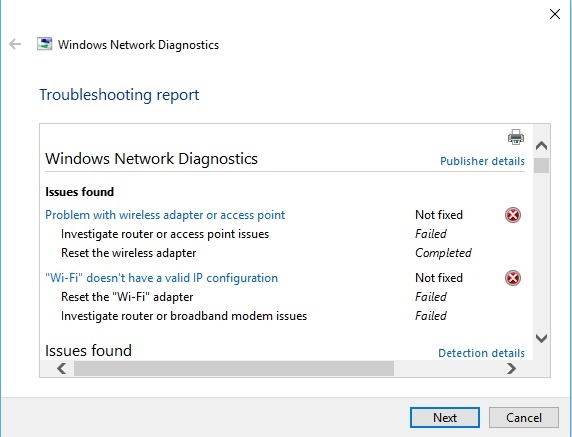 My laptop will still connect to this alternative connection, but will not connect to the main wifi. Our phones however can still be connected to either the main Virgin Media or the BT Homespot P3F one, just as normal. It is only the laptop where the problem is. I would much appreciate some help with this problem. I hope I have explained the situation adequately. EDIT: Ooops sorry. After posting the above, I thought I would try turning the router on and off again. This didn't work the first time I tried it, but this time it seems to have connected okay. I am hoping it has fixed things, but will let you know if there are any further problems. Edited by Channeal, 27 October 2018 - 10:40 AM. Just checking to see if everything is still good with the Wi-Fi connection. Yes thank you, everything seems okay with the WiFi now. Thanks for checking. Have a good week and don't work too hard. My main Internet connection went again today. Once again, a hard reset fixed the problem. What I do not understand though is why once again the second Internet connection in another room stayed okay. I cannot get my head around how that could happen. As it is just an extension from the router via the electricity circuit, surely it should go down whenever the main connection does? I suspect I am missing something crucial though and I am sure the answer will be patently obvious to you! Another weekend is looming, so I hope it is a good one for you and that you get a chance to relax a little. What I do not understand though is why once again the second Internet connection in another room stayed okay. Not sure how that is happening, are you to actually able to do Google searches and visit GTG while the main router is turned off. Cup match with the little one today then feet up for the rest of the weekend, other than internet connection issues I trust that you are not too busy. I was using my laptop and my daughter was using her phone, when we noticed that we were no longer connected to the main Virgin Media connection. We were however able to use the other connection (which comes up as BTHomeSpot-P3F). The Virgin Media connection completely disappeared from the list of available connections on both our phones and on my laptop. For a couple of hours we just used the BTHomeSpot connection and I can confirm that everything worked as normal with this connected. After a couple of hours I turned the router on and off and the Virgin Media connection then reappeared on the list. Very strange! There is nothing exciting going on here this weekend; life is very boring these days! I hope your grandson's team won their cup match. Enjoy your rest for the remainder of the weekend. Edited by Channeal, 10 November 2018 - 11:33 AM. Edit to add: Not suggesting anything needs fixing so please disregard anything suggested at the link. Thanks for the link. Yes, you are understanding correctly. 'Twould be very strange if I was still connected with the router turned off! Strange things do tend to happen here though! Sorry about the team losing, better luck next time. It's a terrible night here, think we might all be washed away!